Non-fiction – Kindle edition; Text Publishing; 304 pages; 2014. One spring evening in 2005, a car veered across the Princes Highway in rural Victoria, Australia, crashed through a fence and plunged into a farm dam. The male driver escaped; all three passengers — aged 10, 7 and 2 — were unable to get out and drowned. Was it an accident, or did Robert Farquharson deliberately drive the vehicle into the dam in order to kill his three young sons, whom he was returning to their mother after an access visit on Father’s Day? The police thought the latter. They charged him with three counts of murder, and he was tried at the Supreme Court of Victoria in August 2007. This House of Grief examines the court case in exacting detail. 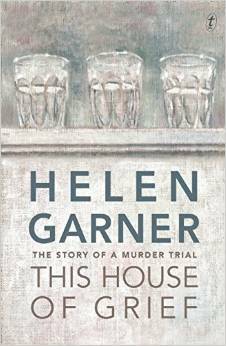 I’m not going to chart all the dizzying twists and turns of the case — that’s what the book is for — but Helen Garner proves a kind and competent guide throughout. Her observations are often incisive and cutting, and I like the way she explores the accused’s back story and adds in extra detail gleaned from conversations she has with members of his family and other witnesses. Their eyelids drooped. Their necks grew loose with boredom; they were limp with it, barely able to hold themselves erect. Once I glanced over and saw four of them in a row, their heads dropped on the same protesting angle towards their left shoulders, like tulips dying in a vase. I read this book in one blistering fever of furious page-turning — or should I say Kindle button-clicking? — on a wet Saturday eager to discover answers to my questions: Did Farquharson deliberately kill his children? Was it a failed suicide bid? Or was it a freak accident, caused by him having a coughing fit at the wheel? By the end, I felt completely wrung out. It was a feeling I couldn’t shake off for days; the story had really wormed its way into my psyche and deeply affected me. To leave such a mark on the reader in the wake of completing the book is testament to Garner’s skill as a writer and journalist. And yet her reportage style, in which she inserts herself into the story, often comes in for criticism. But it’s a style I quite like. Her all-too human reactions and her inner-most thoughts are there on the paper for all to see — removing the illusion that the journalism is utterly objective — and it feels very much as if she’s going on a journey of discovery and you’re coming along for the ride. This testimony filled me with scepticism, yet I longed to be persuaded by it—to be relieved of the sick horror that overcame me whenever I thought of Farquharson at the dam, the weirdness of his demeanour, the way it violated what I believed or hoped was the vital link of loving duty between men and their children. And, as I listened, the phantom of failed suicide shimmered once more into view. Nobody in this whole five-week ordeal had yet said anything that could lay it to rest. While I knew of the Farquharson case — I remember being shocked when I read the initial news story on The Age online all those years ago — I hadn’t followed it closely, so reading this book was very much a journey of discovery for me. I’m not sure how it works if you already know the outcome of the case (perhaps Australian readers can enlighten me? ), but for me it was a fascinating, sometimes frustrating, always intriguing and passionately written read. I like that Garner is open and honest about her fury, disbelief and sheer inability to comprehend certain aspects of the accused’s behaviour, because they were the reactions I had to… and I wasn’t even sitting in the court room. Unless you live in Australia, This House of Grief is currently available to purchase in ebook form only. It will be published in paperback in the UK next month and in the USA in April. UPDATE: This edited extract published on The Australian website will give you a taster of the book. Thank you for reviewing this book. I read this 6 months ago and it has haunted me since, so I’ve been desperate to meet someone else who has read it. Helen Garner writes with such human emotions that you can’t help but be swept along. I felt exhausted after reading it but I would highly recommend it. Thanks for your comment, Fiona. It is one of those books that gets under the skin, isn’t it? This sounds extraordinary. I remember reading Helen Garner’s The Spare Room and being very impressed by her spare writing style. Definitely one for the list. As much as I loved the Spare Room, I tend to prefer her reportage. She’s very much influenced by Janet Malcolm, so her journalistic style is narrative-lead and explores moral culpabilty. I highly recommend Joe Cinque’s Consolation, which is also reviewed here. Thanks for the, Kim. I’ll check it out. Hopefully the download price has dropped since I bought this in the summer — I paid more than £17 for it because I was so desperate to read it. I love Garner’s journalistic work. Aaaah well then i will hang on a bit !! It’s only £8.99 now. Typical. This sounds gripping and horrifying at the same time. Like something so awful that you can’t look away. I hope that, in the end, there are some answers, or I can see how it would stay with you a long time! Well, the jury came up with an answer, but the only person that really knows what happened that night is the accused. This book made my top ten last year. We read it for bookclub and apparently it was a great discussion (unfortunately I missed it). It made no difference to the reading experience knowing the outcome before starting the book. Ah, yes, I remember this from the list you left under my favourite books of 2014 post. Interesting that it doesnt matter if you know the outcome or not; the book is still immensely affecting. Thanks for this. I had missed this being released and you make it sound brilliant. I loved Garner’s The Spare Room. Well, it hasn’t been officially released in UK yet. I paid £17 for Kindle version last August! Thanks for the review. I read Joe Cinque’s consolation and was completely sucked into it but remembered being distressed by this story so wasn’t sure if I could read it. Your review makes me think I’ll give it a go. I love Helen Garner… the first stone was one of my favourite books of all time. I remember reading The First Stone when it came out — I was living in Brisbane at the time and I spent all day reading it from cover to cover, then feeling utterly spent when I came to the end. My flatmate hated the book — and we had a good argument about it. I think most people either love or hate Garner’s work — she’s very devisive amongst readers, I find. True… I think most women could relate to Garner’s story and a lot of men are horrified that it happens so often. Garner is not afraid to be herself and write about her passions which is part of what makes her great for me… and work less for others.